Community First A.M.E. Church moves forward After the stepping down of Rev. John J. Hunter, FAME fully intends to move forward as a beacon of hope for the community with new pastor, J. Edgar Boyd. The City of Angels lost one of its most vibrant, often designated honorary seraphim, Zelma Stennis, on July 2. 2013. She died at home of natural causes while under hospice care, according to her son, William Stennis. Mrs. Stennis was born in Detroit, Michigan to the Reverend Levi and Fannie Miles in 1922 which was a perilous time for people of color. As a five year old elementary school student, she demonstrated prodigy-like talent on the piano which gained widespread attention from her school, her teachers, her neighbors, her church, and her community. As her musical proficiency blossomed, so did the acknowledgement of her talent. Adding the harp to her skill set, she became a local heroine in constant demand as a guest artist at school and community recitals and concerts in an ever-widening circle. She often noted that the recognition of her artistry reached its apotheosis when, as the most notable promising young musician in Detroit, she was selected to present a floral bouquet to the then Grande Dame of the singing world, Marian Anderson at her appearance in that city. This left a lifelong impression which undoubtedly was one of her last memories. More plaudits and honors followed as Oberlin College provided her a yearly scholarship to continue her musical studies while she was still in high school. She enrolled in Wayne State University, and met her husband-to-be, Willie James Stennis, as she went back and forth to work at a part-time job at the A and P Tea Company. Attracted by the lure of what they believed to be unlimited possibilities, she and William went to Los Angeles to get married. But they realized that the time was not optimum to pull up stakes and live on the West Coast, so after a short stay they returned to Detroit. opened their first restaurant, The Chicken Roost, which became a popular and thriving business. With a more than five year span of restaurant operations now on their resumes and in their bones, they re-visited their California dream, returned to Los Angeles, and opened their first Los Angeles fried chicken eatery, The Golden Bird, at Adams and Normandie. Family history has it that when the Stennises were making their first batches, they both kept thinking that the chicken was the color of gold. Thus the birth of a much beloved brand. This new establishment became the prototype for a chain of the most highly successful fast food establishments in Los Angeles’ history. Not only was the food delicious, the chain had a “down home” authenticity and cachet which attracted celebrities, corporate types, families and “just plain folks.” And everybody was treated with equal grace, courtesy, and respect. They had developed a winning formula. When they frequently spoke about the development of their businesses, they unfailingly gave credit to another couple from Detroit who sold them the recipe for the chicken batter and also sold them the property where their first Los Angeles restaurant would operate with wild success. were knocking at her door to make a case for advice, counsel, and financial investment. Despite the meteoric rise in her financial and social status, Zelma Stennis was a grounded, enormously kind, and wise woman. Over the years, while raising a family, she and her husband gave millions of dollars to a wide ranging palette of charitable organizations. 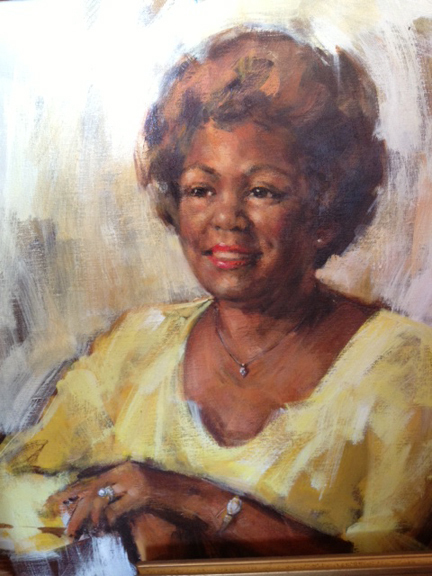 In addition, she became the first lady of a baronial mansion in the then still mostly segregated Hancock Park. As they had been to Nat King Cole, the fabled entertainer and original owner of the home, a majority of the neighbors were hostile, unkind and made it plain that they were not happy about the Stennis’ presence on their street. Nonetheless, Mayor Tom Bradley often asked them to entertain visiting dignitaries in their home. Among the feathers in her cap, was bringing the pinnacle of Europe's premier fashion, The Ebony Fashion Fair traveling fashion show to Los Angeles, which raised millions of dollars for charities. Mrs. Stennis rose above the fray and regularly entertained celebrities, black and white society figures, family, and a host of friends. She was known for fostering and promoting newly minted artists, performers and authors as well as those who were at the height of their careers. Many proudly recall that she mentored scores of young men and women in matters of manners, morals, and money. Mrs. Stennis epitomized grace and style as she was always elegantly dressed and a gracious entertainer. She was a member of Holman United Methodist Church and many organizations and clubs in the African American community that included Jack and Jill of America; Angel City Chapter of The Links, Inc.; The Lullaby Guild of Los Angles; and The Wilfandel of Los Angeles (one of the oldest African-America Women’s Clubs in California). She was the first African American appointed by Mayor Tom Bradley to the Los Angeles Convention and Tourism Commission. She was pre-deceased by her husband, Willie James, and her youngest son, Michael Daryl. She is survived by her sons Roger Maurice, William Clayton, and Kevin Pierre. She is also survived by three daughters-in-law, Bridget, Erin, and Helaine; her sisters, Esther Cherry and Gwen Spann, 11 grandchildren, and several great grandchildren. One great great grandchild and several nieces and nephews are also included among her survivors. “She was a marvelous woman,” said Sentinel publisher Danny Bakewell Sr.
A celebration of the life of Zelma Stennis will be held at the Holman United Methodist Church, Saturday July 13th at 10AM.